Peter James Crouch (born 30 January 1981) is an English professional footballer who plays as a striker for Premier League club Burnley. He was capped 42 times by the England national team between 2005 and 2010, scoring 22 goals for his country in that time, and appearing at two World Cups. Crouch is one of 28 players to have scored 100 or more Premier League goals, holding the record for the most headed goals in Premier League history. Crouch began his career as a trainee with Tottenham Hotspur. He failed to make an appearance for Spurs and after loan spells at Dulwich Hamlet and Swedish club IFK Hässleholm he joined Queens Park Rangers. After QPR were relegated at the end of the 2000–01 season, Portsmouth acquired him on a transfer deal worth £1.5 million. He had a strong first season at Fratton Park, and after scoring 19 goals for the club, he joined Aston Villa in March 2002 for £5 million. He had a relatively poor spell at Villa, however, and was loaned out to Norwich City in 2003 before making a move to Southampton, where he regained his form, which would ultimately prompt his joining Liverpool in July 2005. At Liverpool he enjoyed considerable success, winning the FA Cup and FA Community Shield in 2006, and also gaining a runners-up medal in the 2007 UEFA Champions League Final. Crouch was born in Macclesfield, Cheshire, but his family moved to Singapore when he was one year old. His family's move to Singapore came about when his father Bruce, originally from Fulham, took up a job offer to work at a Singaporean advertising agency. The Crouch family spent three years living in the Far East, and moved back to England after Bruce rejected the chance to work in Australia. They then spent time living at a YMCA in Tottenham before settling in Harrow on the Hill. Crouch attended Roxeth Primary and North Ealing Primary and began to play football with Northolt Hotspurs. He was then invited to join the Brentford Centre of Excellence in 1991 and he also played for the boys club West Middlesex Colts whilst attending Drayton Manor High School. Crouch turned down contract offers from Chelsea and Millwall and instead joined Queens Park Rangers in the summer of 1994. He did not stay at QPR for long, however, for in November 1994, the coaching staff at Loftus Road moved to Tottenham Hotspur, including its youth team manager Des Bulpin, who offered Crouch a contract at Spurs. Crouch's family were Chelsea supporters and he became a ball boy at Stamford Bridge at the age of ten. As a child, he attended some Chelsea matches. Later, he told the Liverpool official website that despite this, he and his friends at the time were fans of QPR. Crouch signed a professional contract with Tottenham Hotspur on 2 July 1998, after having played for their youth team. However, he did not make any appearances for their first team and was loaned out to other clubs, having brief spells at Dulwich Hamlet in the Isthmian League Premier Division and, in the summer of 2000, IFK Hässleholm in Sweden, where he played in the local fourth-highest division. His move to Sweden came about when IFK Hässleholm sold Jon Jönsson to Tottenham for £70,000 and also agreed two loan deals for the Swedish club, that of Crouch and Alton Thelwell. On 28 July 2000, Tottenham sold Crouch to First Division club Queens Park Rangers for £60,000. He made an immediate impression with QPR, scoring ten league goals in the 2000–01 season, but it was not enough to prevent the team's relegation to the Second Division. In March 2002, Premier League club Aston Villa made a successful £5 million bid for Crouch. He scored on his home debut for Villa, the equalising goal against Newcastle United, and went on to score twice in seven appearances. Crouch, however, failed to hold down a regular place in the Aston Villa team in the following 2002–03 season making 18 appearances without scoring. Looking for first team football, he was loaned to Norwich City from September to December 2003. Crouch played 15 times for the Canaries in 2003–04, scoring four goals helping the team gain promotion. Crouch was sent off for retaliation during Norwich's 3–1 win at Walsall, but nonetheless his spell at Norwich renewed interest in his abilities from other clubs. At the end of the three-month loan, he returned to Aston Villa, and scored a brace against Leicester City, a late winner at Middlesbrough and the opener at Bolton Wanderers. Villa sold Crouch in July 2004 to Southampton for a fee of £2.5 million. Crouch underwent intense media scrutiny because of a goal drought during his first months at Liverpool. For 19 matches—the span of four months—he was unable to score. Crouch was praised for other facets of his game, such as his touch on the ball, but his first goal for the club evaded him. The fact that Crouch possessed "good touch for a big man" became something of a media cliché during this time. Early in his Liverpool career, the supporters composed a new chant: "He's big, he's red, his feet stick out the bed, Peter Crouch, Peter Crouch." The drought finally ended on 3 December 2005 when he scored against Wigan Athletic. Although this first goal was originally given as an own goal, it was later awarded to Crouch on appeal; he went on to score a second goal in the same match. Before these goals, Crouch had played over 24 hours of football for Liverpool without scoring. In addition to this, he also had to deal with unpleasant taunts from crowds at matches, as he had throughout his footballing career, who often chanted "freak" at him due to his unusual height. He went on to score several goals that season, including the only goal in the fifth round of the FA Cup against Manchester United, Liverpool's first victory over them in the FA Cup post-Second World War. On 13 May, he helped Liverpool to win the 2006 FA Cup Final against West Ham United, providing an assist for Steven Gerrard to score the second Liverpool goal. Three months later, in the curtain-raiser to the 2006–07 season, he headed the winning goal for Liverpool in the club's 2–1 victory over Chelsea in the FA Community Shield. In their 2006–07 UEFA Champions League campaign, he scored his first goals in European club competition against Maccabi Haifa. Crouch sustained a broken nose when playing against Sheffield United in February 2007. Although he played in some subsequent matches, on 9 March 2007, it was announced that he would undergo surgery on the injury that would keep him out of football for a month. On 31 March, he returned to action after the operation and scored the first hat-trick of his club career, coming against Arsenal in a 4–1 victory. This was also a so-called "perfect hat-trick," consisting of goals scored from his right foot, left foot and head. He later participated in the 2007 UEFA Champions League Final, coming on as a substitute for Javier Mascherano as Liverpool were defeated by Milan in Athens. He ended the 2006–07 season as Liverpool's top goalscorer in all competitions, with eighteen goals. At the start of the 2007–08 season, he had restricted opportunities to play for Liverpool due to the arrival of other strikers, including Fernando Torres, but nonetheless scored against Toulouse in a Champions League qualifying win in August, his eighth goal in his past ten appearances in that competition, and then also scoring the first and last goals of an 8–0 win over Beşiktaş in the first round of the Champions League in November. On 19 December, Crouch was sent off in the quarter-finals of the League Cup, receiving a straight red card for a foul on Chelsea's John Obi Mikel as Liverpool exited the tournament. In April, he scored a vital goal in a 1–1 draw against Arsenal, helping Liverpool secure fourth spot ahead of local rivals Everton. On 7 July 2008, it was announced that Crouch had verbally agreed to join former club and FA Cup holders Portsmouth in a deal worth up to £11 million. Crouch passed his medical the following day, and, on 11 July, Crouch's transfer was officially unveiled at a Portsmouth news conference. Crouch scored his first goal on his return to Portsmouth in a 3–0 win against Everton at Goodison Park on 30 August 2008. Crouch then went on to net his first goal at Portsmouth's Fratton Park home ground in the Premier League against Tottenham Hotspur on 28 September. On 2 October 2008, Crouch scored twice in extra time in a UEFA Cup match away to Portuguese team Vitória de Guimarães to help Portsmouth reach the group stages of the competition. He went on to score twice against Heerenveen in a 3–0 victory at Fratton Park, however Portsmouth failed to make it out of the group stages. Crouch played 46 times for Pompey in 2008–09, scoring 16 goals as the side finished in 14th position. On 27 July 2009, Tottenham Hotspur signed Crouch from Portsmouth for a fee of £10 million, on a five-year contract. Crouch made his debut for Spurs in a pre-season friendly against Olympiacos, and came on as a substitute in Tottenham's season opening win over Liverpool, making his full Premier League debut for the club in the process. He scored his first goal for Tottenham in the League Cup tie against Doncaster Rovers in a 5–1 win on 26 August 2009. He scored again in his next match, opening his league account with Spurs with a goal in a 2–1 home win against Birmingham City. On 23 September, Crouch scored his first hat-trick for Spurs in a 5–1 win over Preston North End in the League Cup. In May, his late goal against Manchester City in what was being dubbed as the "£15 million pound game" put Spurs in a position to claim their first-ever Champions League berth. After having hit the post and missed a Benoît Assou-Ekotto cross, Crouch scored a header after goalkeeper Márton Fülöp could only parry the ball into his path. On 25 August 2010, Crouch scored a hat-trick at White Hart Lane against Young Boys to help Tottenham to reach the group stage of the 2010–11 Champions League. On 15 February 2011, Crouch scored what turned out to be the winning goal in the Champions League second round, first leg match against Milan at the San Siro, sweeping home Aaron Lennon's cut-back after a counter-attack. Three weeks later, Spurs progressed to the quarter-finals after the reverse fixture at White Hart Lane ended 0–0. On 5 April, he was sent off in the 14th minute after receiving two yellow cards in the quarter-finals against Real Madrid. He scored an own goal against Manchester City, which consequently confirmed City into the Champions League for the 2011–12 season with Tottenham missing out. On 31 August 2011, Stoke City signed Crouch from Tottenham for a club record fee of £10 million, that would rise to £12 million, on a four-year contract. Speaking after sealing his move to the Britannia Stadium, Crouch revealed that his former Tottenham teammate Jonathan Woodgate was a major influence upon his decision to join Stoke. Crouch made his debut for Stoke City in a 1–0 win against former club Liverpool on 10 September 2011. He scored his first goal for the Potters in a 1–1 draw against Manchester United, making Stoke the sixth Premier League club he has scored for. He scored his second goal in the following match against Beşiktaş in the 2011–12 UEFA Europa League campaign. Crouch went on to score against Arsenal, Maccabi Tel Aviv, Blackburn Rovers and Wolverhampton Wanderers before missing out on the Christmas period matches after suffering from a virus. Mark Hughes replaced Tony Pulis as manager in May 2013 and despite starting the first two matches of the 2013–14 season, Hughes dropped Crouch to the bench. He returned to the starting line up on 26 October 2013 and scored in a 3–2 defeat against Manchester United. Crouch retained his place in the team for the remainder of the 2013–14 season, where he finished as top scorer with ten goals in 38 appearances as Stoke finished in ninth place. On 28 February 2015, Crouch scored the winning goal in Stoke's 1–0 win over Hull City, equaling Alan Shearer's record of 46 headed goals in the Premier League. He surpassed this on 24 May with a header five minutes after coming on as a substitute to conclude a 6–1 home win over Liverpool in Stoke's final match of the season. In total, Crouch matched the previous season's goal tally of ten goals in 38 appearances as Stoke finished in ninth position for the second consecutive season. Following the end of the season, Crouch underwent groin surgery. Crouch struggled for game time in 2015–16 making 18 appearances of which nine were as a substitute. He scored just twice, which came against lower league Fulham and Doncaster Rovers in cup competitions. Crouch scored a hat-trick away to Stevenage in the EFL Cup, on 23 August 2016 in a 4–0 win. On 9 January 2017, Crouch signed a new contract with Stoke in a deal lasting until the summer of 2018. Crouch scored four goals in five games at the turn of the year including his 100th Premier League goal, the oldest player to hit the landmark. Crouch made 29 appearances in 2016–17, scoring ten goals, as Stoke finished in 13th position. After the season ended Crouch stated that he wants to continue playing until he is 40. 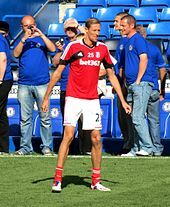 Crouch set a record for the most number of appearances as substitute in the Premier League, on 20 November 2017 when he came off the bench for the 143rd time against Brighton & Hove Albion, breaking the record held by Shola Ameobi. He also became Stoke City's leading Premier League goalscorer of all time during the same season, reaching 45 goals and overtaking the 43 scored by Jonathan Walters  Crouch signed another one-year contract extension with the Potters in November 2017. Crouch played 34 times in 2017–18, scoring six goals as Stoke were relegated to the Championship. Crouch signed for Premier League club Burnley on 31 January 2019 on a contract until the end of the 2018–19 season in a player-exchange deal with Sam Vokes. Crouch made his debut for Burnley on 2 February coming on as a 76th minute substitute in a 1–1 draw against Southampton; he made an immediate impact, as he was instrumental in Burnley being awarded their first penalty for a season-and-a-half. Crouch was capped for the England under-20 team at the 1999 FIFA World Youth Championship, with teammates including Stuart Taylor, Ashley Cole, Andrew Johnson and Matthew Etherington. However, the team finished bottom at the group stage, with three losses and having scored no goals. He was later a part of David Platt's England under-21 team, which went to the finals of the European Under-21 Championship in Switzerland in May 2002, where he scored once against Switzerland. In May 2005 he was handed his first call-up to the England senior squad by manager Sven-Göran Eriksson for the team's tour of the United States, making his debut against Colombia. He went on to make two appearances during the 2006 FIFA World Cup qualifying campaign for England: starting against Austria in a 1–0 victory and coming on as a substitute against Poland in a 2–1 win. In the latter appearance, Crouch's introduction as a second-half substitute was booed by England's own supporters. On 1 March 2006, he scored his first goal for England, with the equaliser in a 2–1 friendly win over Uruguay. He did this whilst bizarrely wearing two different squad numbers on his shirt – No. 21 on the front (his designated squad number for the match), and the incorrect No. 12 on the back. In May 2006, Crouch was included in the 23-man England squad for the 2006 FIFA World Cup, and was expected to be a significant figure in the team due to Wayne Rooney's foot injury. On 30 May, he played in a pre-World Cup friendly against Hungary, scoring the third goal in England's 3–1 win. He followed his goal with his iconic robotic dancing goal celebration. On 3 June, he scored a hat-trick in a 6–0 pre-World Cup friendly victory against Jamaica where he again performed his robotic celebration. After his displays in England's friendlies, Crouch partnered with Michael Owen in attack for England's opening 2006 World Cup match against Paraguay on 10 June 2006. England won the match 1–0 and Crouch kept his place in the starting line-up for the following match against Trinidad and Tobago, against whom he scored his first competitive international goal. The goal provoked some controversy as replays showed Crouch to be pulling on Brent Sancho's long hair, holding the defender down, to gain an advantage. Crouch was rested for England's third group match against Sweden as Rooney returned from injury to join the starting line-up. However, Owen suffered a serious knee injury in the opening minute of the match and Crouch replaced him, playing the remainder of the match. In England's 1–0 second round victory against Ecuador, Crouch remained an unused substitute as Eriksson switched the team to a new formation with Wayne Rooney as a lone striker. After Rooney's dismissal for a foul in England's quarter-final against Portugal, Crouch came on as a substitute for Joe Cole, as England went on to get knocked out on penalties. 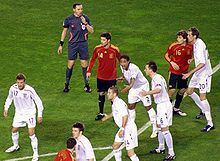 On 5 September 2007, retired English referee Graham Poll claimed that FIFA had specifically warned referees at the event to pay close attention to Crouch, claiming that "he's a real pain and he's getting away with too much." Crouch remained a part of the England set-up under Eriksson's successor as manager, Steve McClaren, and started McClaren's first match in charge, a friendly against Greece in August 2006. He scored twice in England's 4–0 victory. 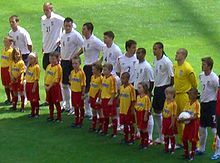 Two further goals followed in England's next match, a 5–0 win over Andorra in their opening qualifying match for UEFA Euro 2008 on 2 September 2006. Contemporary reports suggested that Crouch was the first player ever to reach ten goals for England within a single calendar year. In fact, this had happened several times pre-Second World War, most recently by Dixie Dean (12 goals in 1927) and George Camsell (11 goals in 1929). An operation needed for a nose injury he sustained playing for Liverpool prevented him from playing in England's two qualifying matches in March 2007. He returned to the England squad for their matches against Brazil and Estonia in late May and early June 2007, scoring in the qualifying match against the latter. Crouch was England's top scorer in the qualifying campaign with five goals, but this did not prevent England finishing only third in their group and failing to progress to the finals of the competition. 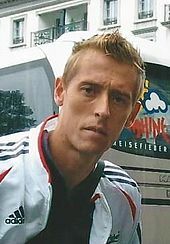 On 1 April 2009, Crouch made his first start under McClaren's successor, Fabio Capello, in a 2010 World Cup qualifier against Ukraine. He scored England's first goal in their 2–1 victory. Crouch was re-called to the England squad for the friendly against Slovenia and the World Cup qualifier versus Croatia, following his fine form for Tottenham. Crouch also got an early first half goal against Belarus in the final 2010 World Cup qualifier, which he then followed up with a second goal in the 76th minute. This took Crouch's tally for England up to 18 goals in just 17 starts. Crouch scored a brace after coming on as a substitute against Egypt in a friendly on 3 March 2010 to take his overall international goal tally to 20. He also scored the second goal for England against Mexico at Wembley Stadium on 24 May 2010. Crouch was named in Capello's final 23-man squad for the 2010 World Cup and was given the number 9 shirt. He came on as a substitute for Emile Heskey in England's opening match against the United States and also came off the bench for Gareth Barry in the following match against Algeria. Crouch did not take part in the final group stage match with Slovenia or the 4–1 loss to Germany in the last-16. During a run of good form in September 2017, Crouch said in a television interview that he was not officially retired from international football. Although generally known as "Crouchy," other nicknames he has been given by fans and the media in England have included "RoboCrouch" and "Crouchinho" (an ironic use of the "-inho" suffix, meaning "little" in Portuguese and used by many Brazilian footballers). He has been also referred to as "Mr. Roboto" by Univision's commentators and as "Pantera Rosa" ("Pink Panther") by Fox Sports en Español commentators. In the summer of 2006, Crouch adopted a robotic dancing goal celebration. A parody of a dance he had been seen performing on a television programme covering a party held at England teammate David Beckham's house, he first performed it after his goal for England against Hungary on 30 May. He again performed the dance after both of his first two goals against Jamaica on 3 June. The Daily Mirror newspaper wrote that the dance was inspired by the lyrics to the Arctic Monkeys' hit single "I Bet You Look Good on the Dancefloor". On 6 August 2007, Crouch said he would never use the robot dance again unless he scored in the UEFA Champions League Final, but he partially reprised it on 1 April 2009 after scoring during England's World Cup qualifier against Ukraine after a Comic Relief sketch. On 1 February 2017, Crouch gave the dance a final outing to celebrate his 100th Premier League goal. Crouch and model Abbey Clancy married on 30 June 2011. Together they have two daughters and a son, Sophia Ruby (born March 2011), Liberty Rose (born June 2015) and Johnny (born January 2018). Crouch released his autobiography in 2007, titled Walking Tall – My Story. His second book, How to be a Footballer, was released in 2018. In Autumn 2018, the first series of That Peter Crouch Podcast aired, featuring Crouch along with Tom Fordyce and Chris Stark. Crouch has a GNVQ in Leisure and Tourism, which he obtained as part of a mandatory educational programme while at Tottenham Hotspur. ^ a b c d e Hugman, Barry J., ed. (2010). The PFA Footballers' Who's Who 2010–11. Edinburgh: Mainstream Publishing. p. 101. ISBN 978-1-84596-601-0. ^ Ronay, Barnay (1 August 2009). "Are we addicted to Peter Crouch?". The Guardian. London. Retrieved 1 August 2009. ^ "Peter Crouch: Stoke striker holds Premier League record for most headers". BBC Sport. 9 October 2017. ^ Wallace, Sam (6 October 2007). "Peter Crouch: The tall guy (and his dad)". The Independent. London. Retrieved 4 August 2015. Bruce and Jayne were 21 when Peter was born and within two years the young family moved to Singapore for Bruce's work. ^ a b c d e Crouch, Peter (2007). Walking Tall My Story. Hodder & Stoughton. ISBN 9780340937129. ^ Duffy, Michael (4 June 2006). "My Pete's No Freak". Sunday Mirror. London. Archived from the original on 12 December 2007. Retrieved 4 June 2006. ^ "Benitez expects test from Chelsea". BBC. 12 April 2007. Retrieved 12 April 2007. ^ Hunter, Steve (13 April 2007). "Crouch: I Love it at Liverpool". Liverpool F.C. Archived from the original on 15 April 2007. Retrieved 13 April 2007. ^ a b "Peter Crouch". England Football Online. Glen Isherwood & Peter Young. 24 May 2017. Retrieved 27 November 2017. ^ Walker, Michael (17 June 2006). "Mellberg says Crouch is biggest threat". The Guardian. London. Retrieved 18 June 2006. ^ "Peter Crouch: Former Tottenham Hotspur and Stoke City man in Sweden". Les Rosbifs. Archived from the original on 10 June 2013. Retrieved 7 June 2013. ^ "Francis grabs Grieves". BBC Sport. 2 August 2000. Retrieved 10 December 2011. ^ "Huddersfield 2–1 QPR". BBC Sport. Retrieved 18 July 2016. ^ "Portsmouth sign £1.5m Crouch". BBC Sport. 4 July 2001. Retrieved 10 December 2011. ^ "Crouch tipped for the top". BBC Sport. 11 November 2001. Retrieved 10 December 2011. ^ "Crouch seals Villa move". BBC Sport. 27 March 2002. Retrieved 10 December 2011. ^ "Newcastle held by Villa". BBC Sport. 2 April 2002. Retrieved 10 December 2011. ^ a b "Games played by Peter Crouch in 2002/2003". Soccerbase. Centurycomm. Retrieved 15 April 2017. ^ "Canaries sign Crouch". BBC Sport. Retrieved 18 July 2016. ^ a b c d "Games played by Peter Crouch in 2003/2004". Soccerbase. Centurycomm. Retrieved 15 April 2017. ^ "Crouch eyes Canaries stay". BBC Sport. Retrieved 18 July 2016. ^ "Crouch joins Saints". BBC Sport. Retrieved 18 July 2016. ^ "Beattie to complete £6.5m Everton switch". The Daily Telegraph. London. 3 January 2005. Retrieved 30 May 2017. ^ "Middlesbrough 1–3 Southampton". BBC Sport. 20 March 2005. Retrieved 30 May 2017. ^ "Southampton 2–1 Portsmouth". BBC Sport. 29 January 2005. Retrieved 30 May 2017. ^ "World Cup Scouting – Peter Crouch". BBC Sport. Retrieved 30 May 2017. ^ "Southampton 1–2 Man Utd". BBC Sport. 15 May 2005. Retrieved 30 May 2017. ^ "Crouch completes Liverpool move". BBC Sport. 20 July 2005. Retrieved 7 June 2013. ^ Glendenning, Barry (10 October 2005). "The Crouch-a-saurus". The Guardian. London. Retrieved 4 June 2006. ^ Garfield, Simon (25 March 2007). "The long and the short of it". The Observer. London. Retrieved 6 April 2007. ^ "Liverpool 3–0 Wigan". BBC Sport. 3 December 2005. Retrieved 14 July 2009. ^ Taylor, Daniel (25 May 2006). "Crouch rises above the jibes to feel at home among the elite". The Guardian. London. Retrieved 4 June 2006. ^ "Liverpool 1–0 Man Utd". BBC Sport. 18 February 2006. Retrieved 14 July 2009. ^ a b "Liverpool 3–3 West Ham (aet)". BBC Sport. 13 May 2006. Retrieved 22 December 2017. ^ a b "Chelsea 1–2 Liverpool". BBC Sport. 13 August 2006. Retrieved 22 December 2017. ^ "Maccabi H 1–1 Liverpool (agg 2–3)". BBC Sport. 22 August 2006. Retrieved 30 May 2017. ^ "Liverpool star Crouch breaks nose". BBC Sport. 25 February 2007. Retrieved 9 March 2007. ^ "Broken nose for Crouch". Sky Sports. Retrieved 30 May 2017. ^ McNulty, Phil (31 March 2007). "Liverpool 4–1 Arsenal". BBC Sport. Retrieved 31 March 2007. ^ "Crouch hat-trick sees off poor Arsenal". Setanta Sports. 31 March 2007. Archived from the original on 30 September 2007. Retrieved 31 March 2007. ^ a b McNulty, Phil (23 May 2007). "AC Milan 2–1 Liverpool". BBC Sport. Retrieved 22 December 2017. ^ "Liverpool Top Goalscorers 2006–2007 Season". LFCHistory.net. Retrieved 30 September 2014. ^ Hunter, Andy (29 August 2007). "Frustrated Crouch helps Liverpool cruise through". The Guardian. London. Retrieved 1 September 2007. ^ Sanghera, Mandeep (6 November 2007). "Liverpool 8–0 Besiktas". BBC Sport. Retrieved 15 July 2009. ^ Sanghera, Mandeep (19 December 2007). "Chelsea 2–0 Liverpool". BBC Sport. Retrieved 30 October 2014. ^ "Arsenal 1–1 Liverpool". BBC Sport. 5 April 2008. Retrieved 30 May 2017. ^ "Crouch passes Portsmouth medical". BBC Sport. 8 July 2008. Retrieved 9 July 2008. ^ "Portsmouth set to unveil Crouch". BBC Sport. 8 July 2008. Retrieved 8 July 2008. ^ McNulty, Phil (30 August 2008). "Everton 0–3 Portsmouth". BBC Sport. Retrieved 14 July 2009. ^ "Crouch credited with Goodison goal". The News. Portsmouth. Retrieved 30 May 2017. ^ "Crouch credited with third at Everton". Portsmouth F.C. 3 September 2008. Archived from the original on 6 October 2008. Retrieved 4 September 2008. ^ Lyon, Sam (2 October 2008). "Guimaraes 2–2 Portsmouth (2–4)". BBC. Retrieved 3 October 2008. ^ "Portsmouth 3–0 Heerenveen". BBC Sport. 18 December 2008. Retrieved 15 July 2009. ^ a b "Games played by Peter Crouch in 2008/2009". Soccerbase. Centurycomm. Retrieved 15 April 2017. ^ Ley, John (10 August 2009). "Peter Crouch upbeat after Tottenham debut". The Daily Telegraph. London. Archived from the original on 8 January 2014. Retrieved 30 September 2014. ^ McNulty, Phil (16 August 2009). "Tottenham 2–1 Liverpool". BBC Sport. Retrieved 7 December 2017. ^ "Doncaster 1–5 Tottenham". BBC Sport. 26 August 2009. Retrieved 27 August 2009. ^ Lyon, Sam (29 August 2009). "Tottenham 2–1 Birmingham". BBC Sport. Retrieved 5 September 2009. ^ Fletcher, Paul (23 September 2009). "Preston 1–5 Tottenham". BBC Sport. Retrieved 13 June 2010. ^ a b "Games played by Peter Crouch in 2009/2010". Soccerbase. Centurycomm. Retrieved 7 December 2017. ^ McNulty, Phil (5 May 2010). "Tottenham reach Champions League (Man City 0–1 Tottenham)". BBC Sport. Retrieved 6 May 2010. ^ Sanghera, Mandeep (25 August 2010). "Tottenham 4–0 Young Boys (agg 6–3)". BBC Sport. Retrieved 25 August 2010. ^ Sanghera, Mandeep (15 February 2011). "AC Milan 0–1 Tottenham". BBC Sport. Retrieved 6 April 2011. ^ McNulty, Phil (9 March 2011). "Tottenham 0–0 AC Milan (agg 1–0)". BBC Sport. Retrieved 6 April 2011. ^ Vesty, Marc (5 April 2011). "Real Madrid 4–0 Tottenham". BBC Sport. Retrieved 5 April 2011. ^ "Man City 1–0 Tottenham". BBC Sport. 10 May 2011. Retrieved 7 June 2013. ^ "Crouch Seals Club Record Transfer". Stoke City F.C. 31 August 2011. Archived from the original on 27 October 2011. Retrieved 31 August 2011. ^ "Stoke City sign Tottenham Hotspur's Peter Crouch in £12m deal". BBC Sport. 31 August 2011. Retrieved 31 August 2011. ^ "Woodgate backs Crouch for England duty". The Sentinel. Stoke-on-Trent. Archived from the original on 22 February 2014. Retrieved 5 June 2013. ^ "Crouch Handed Potters Debut". Stoke City F.C. 11 September 2011. Archived from the original on 20 October 2011. ^ Da Silva, Michael (24 September 2011). "Stoke 1–1 Man Utd". BBC Sport. Retrieved 22 March 2013. ^ Rostance, Tom (1 October 2011). "Stoke 2–1 Besiktas". BBC Sport. Retrieved 22 March 2013. ^ "Crouch struck down by virus". The Sentinel. Stoke-on-Trent. 27 September 2011. Archived from the original on 5 May 2013. Retrieved 22 March 2013. ^ Sheringham, Sam (2 January 2012). "Blackburn 1–2 Stoke". BBC Sport. Retrieved 3 January 2012. ^ "Peter Crouch 'proud' to reach 100 league goals". BBC Sport. 2 January 2012. Retrieved 3 January 2012. ^ Lillywhite, Jamie (24 March 2012). "Stoke 1–1 Manchester City". BBC Sport. Retrieved 12 September 2016. ^ "Stoke striker Peter Crouch joy at 'best' career goal". BBC Sport. 25 March 2012. Retrieved 12 September 2016. ^ "Pulis Backs Crouch's Euro Bid". Stoke City F.C. Archived from the original on 9 April 2012. Retrieved 8 April 2012. ^ a b c "Stoke City: Peter Crouch scoops player-of-the-year award". The Sentinel. Stoke-on-Trent. 9 May 2012. Archived from the original on 2 July 2015. ^ Roberts, Simon (29 September 2012). "Stoke 2–0 Swansea". BBC Sport. Retrieved 12 September 2016. ^ "Crouch not thinking of England". football.co.uk. 1 October 2012. Retrieved 30 September 2014. ^ "Stoke City: Peter Crouch still struggling after mouth injury, Tony Pulis reveals". The Sentinel. Stoke-on-Trent. 19 January 2013. Archived from the original on 26 February 2013. Retrieved 22 March 2013. ^ Rose, Gary (29 January 2013). "Stoke 2–2 Wigan". BBC Sport. Retrieved 12 September 2016. ^ Sheringham, Sam (20 April 2013). "QPR 0–2 Stoke". BBC Sport. Retrieved 12 September 2016. ^ a b "Games played by Peter Crouch in 2012/2013". Soccerbase. Centurycomm. Retrieved 15 April 2017. ^ "Peter Crouch ready to make Potters impact". The Sentinel. Stoke-on-Trent. Archived from the original on 29 October 2013. Retrieved 25 October 2013. ^ Edwards, Ian (25 October 2013). "Hughes plays down Crouch speculation". ESPN. Retrieved 7 December 2017. ^ Bevan, Chris (26 October 2013). "Manchester United 3–2 Stoke City". BBC Sport. Retrieved 12 September 2016. ^ a b "Games played by Peter Crouch in 2013/2014". Soccerbase. Centurycomm. Retrieved 15 April 2017. ^ Lewis, Aimee (20 September 2014). "Queens Park Rangers 2–2 Stoke City". BBC Sport. Retrieved 12 September 2016. ^ Chase, Graham (29 September 2014). "Stoke City 1–0 Newcastle United". BBC Sport. Retrieved 12 September 2016. ^ "Peter Crouch: Stoke City's record signing ready to commit future". BBC Sport. Retrieved 12 September 2016. ^ "Stoke City 2–3 Southampton". BBC Sport. 29 October 2014. Retrieved 12 September 2016. ^ Chowdhury, Saj (6 December 2014). "Stoke City 3–2 Arsenal". BBC Sport. Retrieved 12 September 2016. ^ McLeman, Neil (13 December 2014). "Crystal Palace 1–1 Stoke City match report: Peter Crouch frustrates Eagles to earn Potters a point". Daily Mirror. London. Retrieved 14 December 2014. ^ "Exclusive: Key duo extend their stay". Stoke City F.C. Retrieved 29 January 2015. ^ Stone, Simon (28 February 2015). "Stoke City 1–0 Hull City". BBC Sport. Retrieved 12 September 2016. ^ a b "Games played by Peter Crouch in 2014/2015". Soccerbase. Centurycomm. Retrieved 15 April 2017. ^ "Peter Crouch goes under the knife to resolve groin problem". The Sentinel. Stoke-on-Trent. Archived from the original on 28 May 2015. Retrieved 27 May 2015. ^ a b "Games played by Peter Crouch in 2015/2016". Soccerbase. Centurycomm. Retrieved 15 April 2017. ^ "Stevenage 0 Stoke 4". BBC Sport. 23 August 2016. Retrieved 24 August 2016. ^ "Exclusive: Crouch Signs New Deal". Stoke City F.C. 9 January 2017. Retrieved 9 January 2017. ^ "Peter Crouch: Stoke City striker signs new deal with Potters". BBC Sport. 9 January 2017. Retrieved 9 January 2017. ^ "Stoke 1–1 Everton". BBC Sport. Retrieved 31 May 2017. ^ "Peter Crouch just became the oldest player in Premier League history to reach 100 goals". Fox Sports. 1 February 2017. Retrieved 1 February 2017. ^ a b c "Games played by Peter Crouch in 2016/2017". Soccerbase. Centurycomm. Retrieved 21 July 2017. ^ "The secret of my longevity by Stoke City evergreen Peter Crouch". The Sentinel. Stoke-on-Trent. Archived from the original on 30 May 2017. Retrieved 31 May 2017. ^ White, Tom (20 November 2017). "Peter Crouch sets Premier League record for substitute appearances". London Evening Standard. Retrieved 7 December 2017. ^ "Stoke's Peter Crouch breaks Premier League record for substitute appearances". ESPN. 20 November 2017. Retrieved 7 December 2017. ^ "Peter Crouch: Stoke striker extends stay with new deal". BBC Sport. 28 November 2017. Retrieved 7 December 2017. ^ a b "Games played by Peter Crouch in 2017/2018". Soccerbase. Centurycomm. Retrieved 6 June 2018. ^ "Peter Crouch: Stoke City striker signs for Burnley with Sam Vokes moving to Potters". BBC Sport. 31 January 2019. Retrieved 31 January 2019. ^ Howarth, Matthew (2 February 2019). "Burnley 1–1 Southampton: Ashley Barnes penalty rescues point for hosts". BBC Sport. Retrieved 4 February 2019. ^ "FIFA World Youth Championship Nigeria 1999". FIFA. Retrieved 30 May 2017. ^ "England see off Swiss". BBC Sport. 17 May 2002. Retrieved 10 December 2011. ^ "Crouch's giant stride". BBC Sport. 18 May 2002. Retrieved 10 December 2011. ^ "Crouch 'thrilled' at Anfield move". The Guardian. London. 20 July 2005. Retrieved 26 January 2007. ^ "Cole condemns fans' Crouch abuse". BBC Sport. 13 October 2005. Retrieved 26 January 2007. ^ McNulty, Phil (2 March 2006). "England players hail hero Crouch". BBC Sport. Retrieved 26 January 2007. ^ Adamson, Mike (1 March 2006). "England 2–1 Uruguay". The Guardian. London. Retrieved 26 January 2007. ^ "Walcott & Lennon in England squad". BBC Sport. 8 May 2006. Retrieved 30 May 2017. ^ "England 3–1 Hungary". BBC Sport. 30 May 2006. Retrieved 30 May 2017. ^ "C'mon everybody ... Let's do the Crouch!". The Guardian. London. Retrieved 30 May 2017. ^ "PETER CROUCH'S ENGLAND TREBLE SPARKS ROBOTIC CELEBRATIONS". The Football Association. Retrieved 30 May 2017. ^ Stewart, Colin (17 June 2006). "Sancho angry as TV shows Crouch pulled hair to climb". The Scotsman. Edinburgh. Retrieved 17 June 2006. ^ "Sweden 2–2 England". BBC Sport. 20 June 2006. Retrieved 30 May 2017. ^ "England 1–0 Ecuador". BBC Sport. 25 June 2006. Retrieved 30 May 2017. ^ "England 0–0 Portugal". BBC Sport. 1 July 2006. Retrieved 30 May 2017. ^ "Poll says Crouch is targeted by referees". The Guardian. London. 5 September 2007. Retrieved 5 September 2007. ^ Smyth, Rob; Doyle, Paul (4 September 2006). "Passive boozing; and wild-tackling Scouser". The Guardian. London. Retrieved 4 September 2006. ^ "England's top scorers: Calendar year". England Football Online. Glen Isherwood & Peter Young. 14 November 2017. Retrieved 27 November 2017. ^ "Crouch nose he'll miss a month". Fox Sports. 9 March 2007. Archived from the original on 16 March 2007. Retrieved 9 March 2007. ^ a b McNulty, Phil (6 June 2007). "Estonia 0–3 England". BBC Sport. Retrieved 12 September 2016. ^ a b Stevenson, Jonathan (21 November 2007). "England 2–3 Croatia". BBC Sport. Retrieved 12 September 2016. ^ a b McNulty, Phil (1 April 2009). "England 2–1 Ukraine". BBC Sport. Retrieved 12 September 2016. ^ "Capello recalls Crouch and Lennon". BBC Sport. 30 August 2009. Retrieved 13 June 2010. ^ a b McNulty, Phil (14 October 2009). "England 3–0 Belarus". BBC Sport. Retrieved 12 September 2016. ^ "The Peter Crouch Myth". On Goals Scored. Retrieved 30 May 2017. ^ "England in fine fettle thanks to Crouch". UEFA. 3 March 2010. Retrieved 13 June 2010. ^ "England 3–1 Mexico". BBC Sport. Retrieved 30 May 2017. ^ "World Cup 2010: England announce squad numbers". BBC Sport. Retrieved 30 May 2017. ^ "England 1–1 USA". BBC Sport. Retrieved 30 May 2017. ^ "England 0–0 Algeria". BBC Sport. Retrieved 30 May 2017. ^ "Slovenia 0–1 England". BBC Sport. Retrieved 30 May 2017. ^ "Germany 4–1 England". BBC Sport. Retrieved 30 May 2017. ^ a b McNulty, Phil (17 November 2010). "England 1–2 France". BBC Sport. Retrieved 12 September 2016. ^ "Stoke City's Peter Crouch fears for England future". BBC Sport. 12 October 2011. Retrieved 16 October 2011. ^ Hafez, Shamoon (2 October 2017). "Premier League stats: Harry Kane, Man Utd, Man City, Arsene Wenger, Roy Hodgson". BBC Sport. Retrieved 2 October 2017. ^ "RoboCrouch out of operation?". ITV. 13 June 2006. Archived from the original on 29 October 2006. Retrieved 17 January 2007. ^ Hattenstone, Simon (27 September 2006). "Crouch on the couch". The Guardian. London. Retrieved 17 January 2007. ^ Webster, Nick (3 September 2006). "'Pantera Rosa'... England's not so secret weapon!". Fox Sports. Archived from the original on 15 April 2012. Retrieved 17 January 2007. ^ a b Wilson, Steve (2 April 2009). "Peter Crouch's robot dance and the 10 funniest goal celebrations". The Guardian. London. Retrieved 4 April 2009. ^ Lipton, Martin; Byrne, Paul (2 June 2006). "World Cup Willie". Daily Mirror. London. Archived from the original on 9 May 2011. Retrieved 2 June 2006. ^ McNulty, Phil (12 June 2006). "Crouch halts robotic celebrations". BBC. Retrieved 13 June 2006. ^ Wilson, Paul (3 September 2006). "Confident Crouch happy to be plan B". The Observer. London. Retrieved 3 September 2006. ^ "Peter Crouch: Stoke striker 'emotional' to reach 100-goal Premier League milestone". 2 February 2017. Retrieved 2 February 2017. ^ Showbiz, Bang (1 July 2011). "Abbey Clancy marries Peter Crouch". The Independent. London. ^ "Baby joy for Abbey Clancy & Peter Crouch". Mr Paparazzi. 15 March 2011. Archived from the original on 29 March 2012. Retrieved 15 March 2011. ^ Gosling, Francesca (5 January 2018). "Abbey Clancy and Peter Crouch introduce new son with social media snap". www.msn.com. Microsoft News. Archived from the original on 20 November 2018. Retrieved 20 November 2018. ^ "Stoke City star Peter Crouch hit with £1,000 speeding fine". The Sentinel. Stoke-on-Trent. Retrieved 21 August 2012. ^ "Stoke City star Peter Crouch handed driving ban". The Sentinel. Stoke-on-Trent. Retrieved 17 October 2012. ^ Crouch, Peter (2007). Walking Tall My Story. Hodder & Stoughton. ISBN 9780340937129. ^ Crouch, Peter (2018). How to be a Footballer. Ebury Press. ISBN 978-1785039768. ^ Quirke, Antonia (21 November 2018). "The natural charms of Peter Crouch shine through on his podcast". New Statesman. Retrieved 5 January 2019. ^ "That Peter Crouch Podcast". BBC Radio 5 live. Retrieved 5 January 2019. ^ "That Peter Crouch Podcast, That Dreams Episode". BBC Radio 5 live. Retrieved 10 April 2019. ^ "Games played by Peter Crouch in 1999/2000". Soccerbase. Centurycomm. Retrieved 15 April 2017. ^ a b c d "Crouch, Peter". National Football Teams. Benjamin Strack-Zimmerman. Retrieved 10 March 2019. ^ "Games played by Peter Crouch in 2000/2001". Soccerbase. Centurycomm. Retrieved 15 April 2017. ^ a b "Games played by Peter Crouch in 2001/2002". Soccerbase. Centurycomm. Retrieved 15 April 2017. ^ "Games played by Peter Crouch in 2004/2005". Soccerbase. Centurycomm. Retrieved 15 April 2017. ^ "Games played by Peter Crouch in 2005/2006". Soccerbase. Centurycomm. Retrieved 15 April 2017. ^ "Games played by Peter Crouch in 2006/2007". Soccerbase. Centurycomm. Retrieved 15 April 2017. ^ "Games played by Peter Crouch in 2007/2008". Soccerbase. Centurycomm. Retrieved 15 April 2017. ^ "Games played by Peter Crouch in 2010/2011". Soccerbase. Centurycomm. Retrieved 15 April 2017. ^ a b "Games played by Peter Crouch in 2011/2012". Soccerbase. Centurycomm. Retrieved 15 April 2017. ^ a b "Games played by Peter Crouch in 2018/2019". Soccerbase. Centurycomm. Retrieved 10 March 2019. ^ "England 2–1 Uruguay". BBC Sport. 1 March 2006. Retrieved 12 September 2016. ^ "England 3–1 Hungary". BBC Sport. 30 May 2006. Retrieved 12 September 2016. ^ "England 6–0 Jamaica". BBC Sport. 3 June 2006. Retrieved 12 September 2016. ^ "England 2–0 Trinidad and Tobago". BBC Sport. 15 June 2006. Retrieved 12 September 2016. ^ "England 4–0 Greece". BBC Sport. 16 August 2006. Retrieved 12 September 2016. ^ "England 5–0 Andorra". BBC Sport. 2 September 2006. Retrieved 12 September 2016. ^ "Macedonia 0–1 England". BBC Sport. 6 September 2006. Retrieved 12 September 2016. ^ Chowdhury, Saj (16 November 2007). "Austria 0–1 England". BBC Sport. Retrieved 12 September 2016. ^ McNulty, Phil (10 June 2009). "England 6–0 Andorra". BBC Sport. Retrieved 12 September 2016. ^ McNulty, Phil (3 March 2010). "England 3–1 Egypt". BBC Sport. Retrieved 12 September 2016. ^ McNulty, Phil (24 May 2010). "England 3–1 Mexico". BBC Sport. Retrieved 12 September 2016. ^ "Sao Paulo 1–0 Liverpool". BBC Sport. 18 December 2005. Retrieved 22 December 2017. ^ "History: Player of the Season". Portsmouth F.C. Retrieved 7 December 2017.